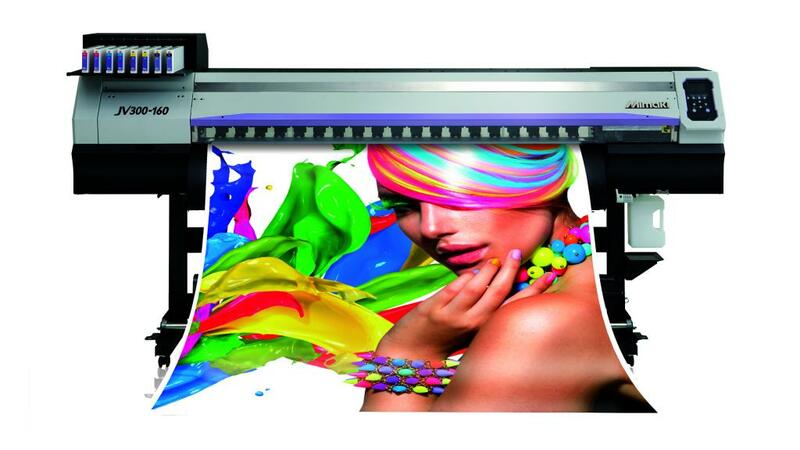 High-speed, high-quality printing is in high demand in the sign and graphics market. 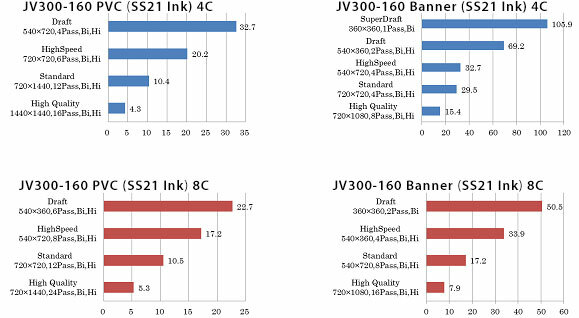 Mimaki, the first manufacturer of solvent-ink wide-format printers, has introduced two new wide format printers to its line of eco-solvent offerings, the JV300-130 and the JV300-160. These printers deliver outstanding speed and stunning beauty, as a new global standard. 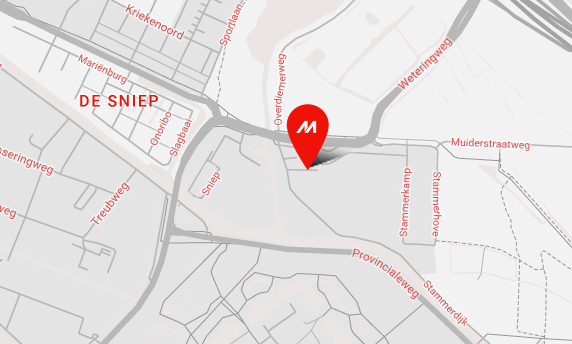 The JV300-130/160 family uses reliable and patented inkjet technologies that ensure high-speed printing at up to 105.9 m2/h* by combining two newly developed staggered print heads and high-performance, quick-drying SS21 ink. Two new ink colors, orange and light black, have been developed for the SS21 ink line. Orange ink achieves a higher level of color reproducibility with a wider color gamut, and light black ink presents beautiful gradation printing. The range of print capabilities can be extended with these printers by using water-based Sb53 sublimation ink for direct or transfer printing. The JV300-130/160 is compatible with solvent and water-based sublimation inks, and provides a wide range of applications including outdoor signage, posters, interior decorating and vehicle wrapping. 1. Advanced ink performance and innovative eco-solvent inkjet printing technology achieve outstanding speed. Two newly-developed staggered print heads deliver a wider print swath. Each ink color has its own specific gravity and viscosity. To achieve precise ink droplet placements onto the media, Mimaki designed an optimum waveform, which allows the print head to jet each ink color at the appropriate jetting angle without losing excellent ink droplet circularity (Figure 1). 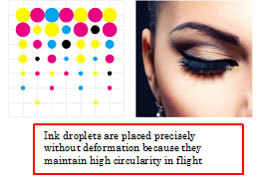 Moreover, various ink droplet sizes are precisely placed from the minimum size of 4pL to the maximum size of 35pL. 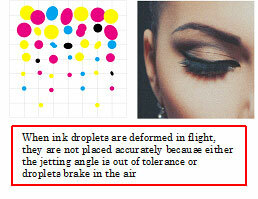 Small droplets create high-resolution and beautiful printing, and large droplets are very useful for speed printing. The Mimaki JV300-130/160 satisfies a wide range of customer requirements, including beautiful high-quality printing at productive speeds. SS21 ink was developed based on Mimaki’s deep knowledge of inkjet printing and its unique technology heritage. SS21 ink dries quickly on media due to a good balance between ink penetration and solvent volatilization. High productivity is achieved through high-density printing at high-speed modes without blocking or bleeding. 1） A wide range of ink colors, including newly developed colors. SS21 ink has nine colors, including newly developed orange and light black. Depending upon the application, the optimum ink set is selected. Figure 2: Orange ink effect. By using the newly developed SS21 orange ink as a process color, 92% of the PANTONE color chart can be closely matched. Thanks to a wider color gamut with orange ink, food freshness can be simulated, and corporate colors can be faithfully represented (Figure 2). Newly developed SS21 light black ink and superior gray-balance control produce accurate grayscale printing without unexpected color shifts, delivering smooth, non-grainy skin tones and grayscale gradation (Figure 3). Due to larger ink droplet size, the JV300-130/160 is able to print white ink at higher density than a conventional solvent model. Accordingly, the degree of white ink opacity is increased. White base layer printing accentuates the brightness of color printing on transparent or opacity media. 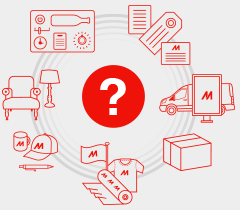 2．Each printed media was placed on Mimaki logo. 3. The light was applied from the reverse side, and the degree of opacity was checked. 3. Water-based sublimation ink Sb53 achieves high-density printing. Sb53 ink is a water-based sublimation ink that produces bright colors and enables high-density printing. The ideal print material is polyester, which is used for apparel fabric, sports uniforms, and swimsuits, as well as for soft signage. The sedimentary degree of the Sb53 ink is lower than a conventional sublimation ink, resulting in a much more stable print without uneven colours. Generally, swath boundaries are straight lines. Therefore, a slight misalignment between boundaries causes banding or uneven color printing. MAPS3 reduces banding and uneven color printing with blurred boundaries similar to gradation printing (Figure 5). Figure 5: Graphic explanation of MAPS3. 2） Three-way intelligent heater system also supports the delivery of the optimum ink droplet form and size. When the temperature of the media is not optimized, the perfect shape and size of droplets do not properly adhere to the media (Figure 6). A patented three-way intelligent heater is built into the JV300, and each heater maintains the temperature appropriately to obtain high-quality printing. 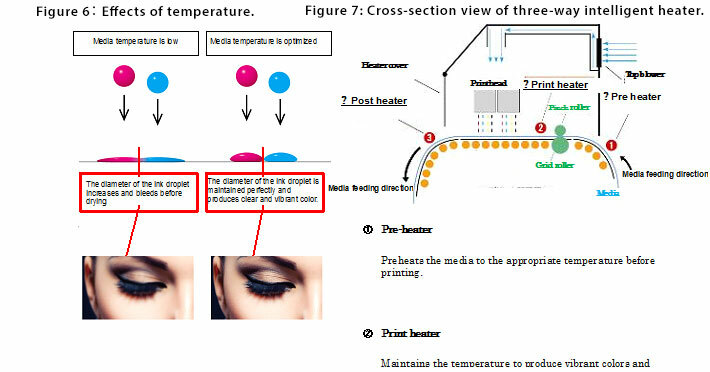 The details of each heater are shown in Figure 7. Ink and media shortage, clogged nozzles, and other minor problems influence stable productivity. JV300 fully supports continuous printing with reliable technologies. 1）Nozzle check unit (NCU) automatically detects clogged nozzles and unclogs them. Clogged nozzles are detected automatically by monitoring ink droplets with sensors. When clogged nozzles are found, the nozzles are automatically cleaned (Figure 8). A monitoring interval is set for each print dataset at specified time intervals. 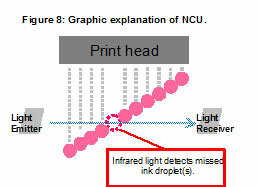 The NCU reduces waste printing after the occurrence of clogged nozzles. Previously, when an issue was not resolved after nozzle cleaning, the print head needed to be repaired by a technician, and printing operation had to be stopped until the maintenance work was completed. The NRS allows the printer to continue print operations without interruption by using non-defective nozzles as substitutes for defective nozzles until the technician arrives. 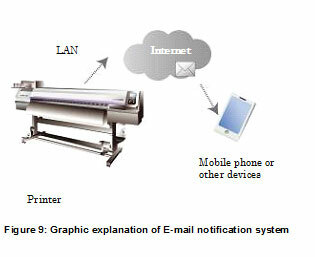 Via the Internet*, printer status is sent to a registered e-mail address when printing is started or finished. In addition, this function sends a notification when an unexpected print stop occurs due to an ink or media shortage, or any other error. The operator is continuously informed of the printer status while an unattended print is running. *Internet and LAN access is required to activate this function. This service will be available by the end of 2014.